Using the Sanborn map from 1910, I used several different sheets to track out the future location for one of Pendleton’s theaters, the Alta Theatre. Using Cinema Treasures, I was able to find the location where the Alta used to be (25 SE Dorion Ave) as well as its first day of operations: September 6, 1913. Using Google Maps to help better contextualize the 1910 Sanborn Map, I had to scour through several of the sheets for the downtown area before I saw the building that would become the Alta Theatre. The Cinema Treasures entry for the theater included a newspaper clipping that reported it was “OPPOSITE CITY HALL,” so I knew the approximate zone. It would have been easy to find the location if Pendleton hadn’t changed Alta Street to Dorion Avenue. I finally found the location on the corner of Main and Alta by comparing how the present location is on Google Maps. 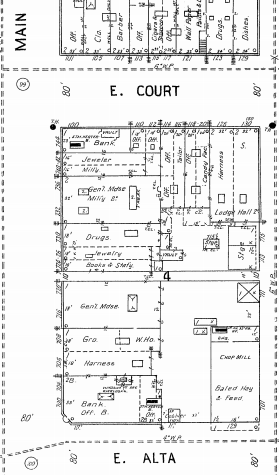 The Alta Theatre likely replaced the business within the lower right quadrant of building 4 which functioned both as a Chop Mill and housed Baled Hay & Feed. Three years from this Sanborn zoning yet six months from the opening of the Alta Theatre, on March 1, 1913, there were a total of five competing theaters in Pendleton, at that point a town of around 5,000. The theaters included the Oregon Theater, the Grand, the Cosy, the Pastime, and the Orpheum. It is pretty amazing that despite its smallish size, there was a major boom in Pendleton for theaters. The oldest theatre, the Cosy, had opened in 1906 alongside the Pastime theatre. Most theatres were in the heart of downtown off of Main Street; in the early 20s the Centre Theatre would be built at 355 S. Main St, then in the mid-30s the United Artists Theatre would open at 108 S. Main St. Through the placement of all the theaters downtown, it likely created much competition that drove theaters (like the Cosy in 1919) out of business. For my post, I chose an ad promoting a program at the Page Theatre in Medford that was published by the Medford Mail Tribune in 1913. It is an interesting artifact for several reasons: one of which is its design. Rather than putting the date, choosing to just have “TONIGHT” could make the reader feel as though it is an event they don’t want to miss out on. 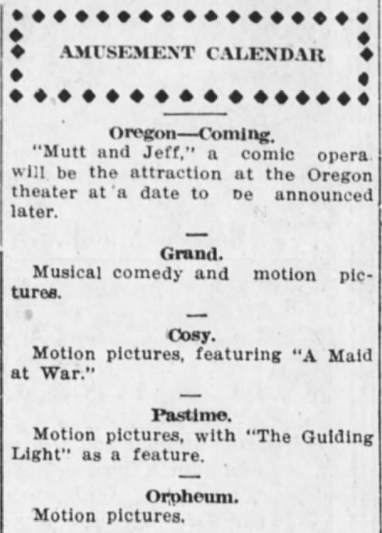 The Three Part program with Kathleen Mavourneen is interesting for its description as a “SURPRISE FRONTIER COMEDY;” in learning on Tuesday about how the frontier in Oregon was of special attraction to women for the freedom and independence it offered, having the combination of these three genres (assuming that SURPRISE is slapstick humor with visual gags) would draw in not only men but also women to the programming. Additionally, presenting “THE ARAB DERVISHES” reveals the interest in entertainment at the time in orientalization and presenting this Arab culture as other and exotic. The wording of “Original Oriental,” is curious, seeming to imply that this Ben Abdies performer was one of the first imitators (one which the Medford theater-goers would be aware of) of this certain style of entertainment. Both billings feature comedy and this ad is interesting for its double-duty in appealing to Oregonians proud of their frontier legacy in following Manifest Destiny and settling in the new haven of the west as well as presenting Arabic culture as Oriental and a source of spectacle. This ad communicates that should the newspaper-reader spend the night at the movies, they would get a taste of both homegrown Americana and exotic non-Americanness. 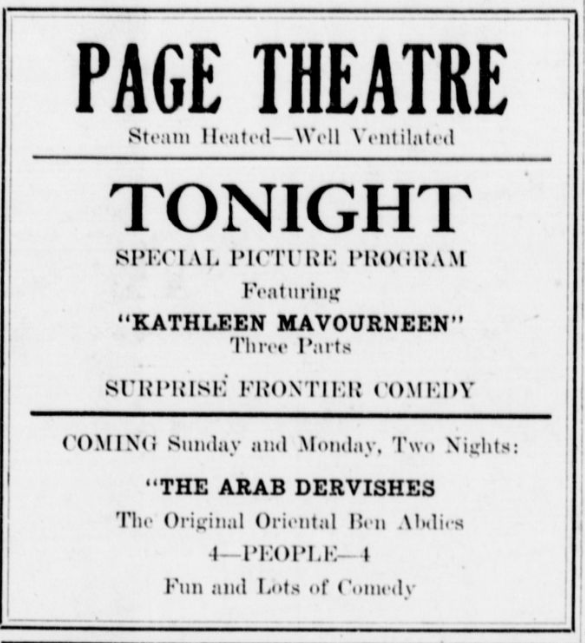 The ad reflects the importance of newspapers in the 1910s as beacons and mainstays of daily culture in American life, especially in consideration that they do not even mention the date of the show, just “TONIGHT.” It also reflects typical advertising of movie houses at the times in emphasizing its architectural features and comforts with “Steam Heated––Well Ventilated.” Certainly when this ad was published in November of 1913, the steam heat might be an equivalent draw to the programming.